One of our greatest joys is sharing our love of jewelry with our customers. For our entire careers, we have prided ourselves on guiding people through developing not just an objectively refined jewelry collection, but also a strong understanding of what it means to own and wear fine jewelry. The knowledge accumulated through decades of jewelry design and manufacturing have uniquely positioned us to share our wealth of knowledge…and we love to share it. We take immense pride in enhancing our clients’ wisdom when it comes to appreciating jewelry. The hunt for the perfect piece of jewelry can feel like a never-ending quest. In those scenarios, we are the first to advocate for custom design. With a custom piece commissioned, the excitement of a client’s jewelry dreams finally coming true can make even the most practical customer anxious to see the final product. Custom design is a lot of work, and therefore takes a fair amount of time. It may take a couple of weeks to see a render of the final design, and get the client's approval. From there, we mill or grow the wax ( 3D Printing). Then we cast the piece in your chosen metal, grind and polish the cast piece, set the gemstones, polish again, and finally, clean your piece to glistening perfection. All in all, it usually takes 4-8 weeks to complete the entire process. Some designs are more complicated than others. 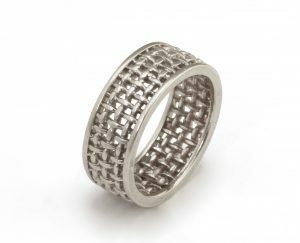 These complex designs, while fun and exciting from a design and manufacturing point of view (we love a jewelry challenge! ), often take even longer to complete than most pieces. To give you a real-life example: we have one customer who is an avid bicyclist and has amassed over 130,000 miles (what?!) on his bike. To put that in perspective, that is over FIVE trips around the Earth at the equator. FIVE. To commemorate this impressive feat, he commissioned a thumb ring. 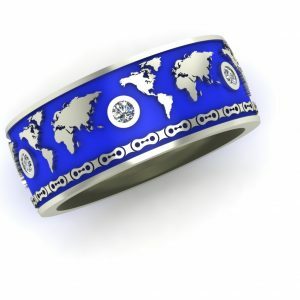 The ring featured a repeating wraparound map of the world, with blue enamel filling in the oceans. The ring also featured a bike chain border and six evenly spaced bezels. In five of the bezels, we placed a diamond, an ode to the five completed circumnavigations. The sixth is currently a gold button, awaiting a diamond when the sixth trip around the Earth is completed (projected to be within the next three years). In a ring this detailed (the outline of the Great Lakes is visible! ), extra time was needed to get everything just right. So when you commission a custom piece, know that the complexity affects the timeline and that getting things right is the top priority. When gold comes out of the ground, it is a bright orangey-yellow. We alloy gold with different white metals (like nickel and silver, for example) to dilute this yellow. But in the end, all white gold is still pale yellow (as we like to say, “We’re jewelers, not magicians.”). So to make white gold bright white and shiny, we electroplate it in rhodium. Rhodium is an exorbitantly expensive precious metal. However, since we are only plating white gold, it is a very affordable and beautiful plating material. 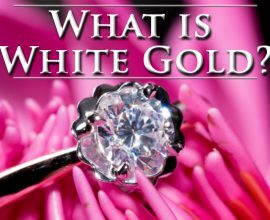 It’s also hypoallergenic, so people who may react badly to some metals will find they can happily wear rhodium-plated white gold. However, as with any plating, eventually that rhodium will come off. Before being refinished and and having rhodium applied (left) and after (right). Note the color of the gold before and after the rhodium has been applied. But not to worry: we are always available to re-dip your jewelry. You can expect to have to have your ring re-rhodiumed every six to 24 months, based on your lifestyle and the thickness of the plating. At Andre’s Fine Jewelers, we do a thicker than average plating of rhodium (assuming the intricacy of the design allows us to do so). Even still, annual plating is recommended if you want to keep that bright white gleam to your white gold jewelry. 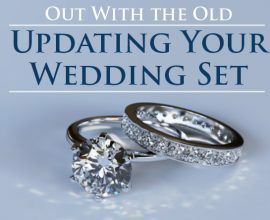 Keep in mind, too, that rings (like wedding sets) need to be redone most often, as they are worn most consistently. By contrast, white gold earrings don’t see a lot of action and therefore may even be able to be stretched past a year depending on how often you wear them. Prongs are the little sticks of metal that hold your diamonds or gemstones in place. Prongs are the most common method used to secure stones. 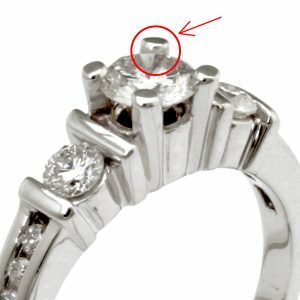 Like rhodium plating, everyday wear and tear can wreak havoc on your prongs if you aren’t careful. Prongs can catch on fabric or objects and get bent out of shape or worse, broken. Both of these scenarios can compromise the safety of your stone. Even if your jewelry doesn’t encounter any trauma or specific damage, everyday wearing results in the gradual thinning and wearing down of the prongs. Eventually, they will be worn down to the point that they are no longer able to keep the stone secured. I know this sounds like gloom and doom, but don’t worry. There is something incredibly simple that will keep you ahead of the game: jeweler checks. Every six to 12 months, bring your oft-worn jewelry (like your wedding set or a bracelet you wear often) to our showroom. Our jewelers will examine your piece and clean it free of charge. They will asses your prongs for efficacy and security. Occasionally, they will tell you that some restorative maintenance is required. That’s okay. An ounce of prevention is worth a pound of cure. By maintaining your prongs, you will extend not only the life of your gemstone jewelry, but also your peace of mind. Before (left) and after have the prongs retipped and refinished (right). Note the height of the highlighted prong. 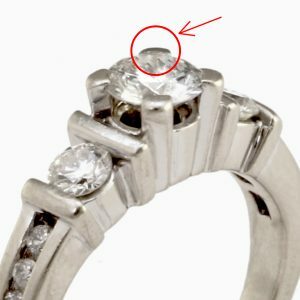 In situations where your jewelry has experienced some sort of trauma (I myself caught the center stone of my engagement ring on the underside of my kitchen cabinets while putting dishes away) and you worry that you may have damaged it, TAKE IT OFF IMMEDIATELY. Do not wear it until it has been examined by a skilled jeweler. When I caught my ring on the cabinet, I couldn’t see any damage, but I brought it in to our showroom. When the center stone was examined under a microscope, it was discovered that I had in fact broken one of my bezel supports (my center stone bezel is an open-work scroll design). But because I brought my ring in, our jewelers were able to fix it. To keep jewelry looking its best, you may be tempted to have it polished regularly. Please don’t. Polishing, while it does bring back that fresh-from-the-showroom luster, is an abrasive process. When we polish your piece, we are buffing off the uneven wear and tear. Think of it the same way you would think of a wood table. If you have some small scratches, you can sand down the table until you’ve removed enough wood to take away the appearance of the scratch. In the short term, that’s no big deal. But in the long term, you will start wearing away a noticeable amount of the wood…or in our case, gold. Repeated unnecessary polishing will eventually wear down your jewelry. This is a particular problem for delicate areas, such as prongs. We want to prolong the life of your jewelry, not curtail it. Cleaning your jewelry is a much better alternative to having is polished regularly. Consistent cleaning efforts keep your jewelry looking its best. Additionally, the cleaning process removes any residue or build up of cleaning products or personal care products. Although not generally an issue, sometimes chemicals or compounds in those products can negatively affect the metal. Removing that buildup helps control wear and tear on the piece. Lastly, if your piece is cleaned regularly, it will stay looking sharp longer, reducing the perceived need for polishing. Cleaning is best done by a professional with professional products. We have the best cleaners and machinery available to us. Some consumer jewelry cleaning products may actually leave a residue or they may be too harsh for your individual piece (harsh cleaners, for example, should never be used on soft materials, such as pearl or opal). 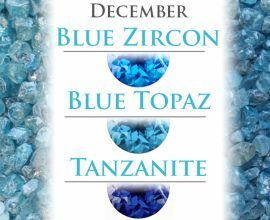 We all know that diamonds are the hardest naturally occurring substance on Earth. They are the epitome of hardness on the Mohs scale. They can scratch anything. They are used to coat the tips of drill bits, along with a laundry list of other industrial applications. 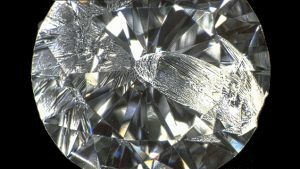 Despite that, there is still a large misunderstanding surrounding a diamond’s strength. Hardness and strength are not the same thing. Think of it like this: a diamond can scratch the head of a hammer. But if you smash that diamond with a hammer, it will shatter. This is what we mean when we say a diamond is hard, but not strong. On the downside, this means that you CAN chip or break your diamond, so take care of your diamond jewelry. However, the upside of this facet (haha, that’s a good one) of a diamond’s character is that we can actually cut diamonds. By controlling the chipping and breaking, lapidaries (or gem cutters) are able to coax gem-quality stones out of diamond roughs. Like I said earlier, we love jewelry. We love that you love jewelry. And we love to share what we know with you; its our passion. If you have any questions about what we’ve covered in this blog, or you simply want to know more about your custom design options or necessary maintenance, stop in to our downtown Brighton showroom. We’ll be there, ready to share.